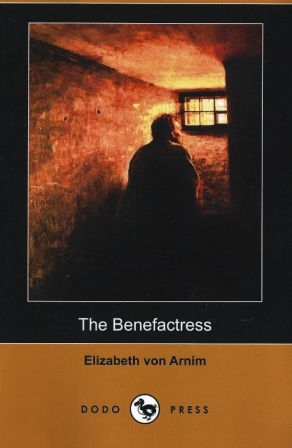 The Benefactress by Elizabeth von Arnim ~ 1901. This edition: Dodo Press, 2012. Softcover. ISBN: 978-1-4099-8059-9. 338 pages. My rating: 9/10. Or maybe even 9.5? Very good stuff. My daughter was attending a dance intensive and working with a choreographer; I spent a fair bit of time parked outside her venue waiting for the brief breaks which required sporadic maternal nurturing in the area of rides back to the hotel for showers, food, band aids and sympathy. She was, as happens every summer, feeling the pain of strenuous dancing after relaxing a bit too much over the previous month of home-studio summer break, and, yes, the maternal words “I told you so!” did leave my lips occasionally, but she easily ducked under them – water off a duck’s sweaty little back – we’ve been doing this a long, long time and we both know our roles inside and out and could run this perennial dialogue in our sleep! The Benefactress was a perfect car-in-parking-lot and hotel room read; just engrossing enough that it was easy to re-enter at a moment’s notice and just complex enough that I could happily mull it over as I crouched meekly in the darkest corner of the dance space waiting for my cues to videotape the completed choreo as it progressed. I am feeling a bit behind on reviews this week – a minor bobbling as I reach to attain my self-imposed goals. I spent way too much time reading, and driving – the trip to the coast, one-way, takes a good seven hours, not counting stops to refuel and stretch our car-cramped legs. Time out to visit a few secondhand bookstores in the towns we pass through is built into our itinerary; my daughter is the perfect travelling and book-browsing companion and I am relishing this year in her company; our next-to-last dance season together before she moves on to the bigger world of college and work and her ensuing “adult” life. We’re back home now, with a stack of new-to-us books which I’m gleefully looking forward to exploring and talking about, so I’m going to cheat a bit on this review and refer you straight to Claire. Her take on The Benefactress is spot-on; I don’t feel like I could add to it in any way except to repeat that I loved this book and it was well worth seeking out. Very highly recommended. I am so glad you loved this and that you got to enjoy it while you were down in my part of the world! It was perfect – just what I needed. Thanks again – I never would have tried it without your recommendation. And I love the coast this time of year, and the abundance of fresh fruit – loaded up with a big box of HUGE blueberries on the way home; the blackberries were tempting but we didn’t stop for any this time round. Next trip in September I’m bringing down a few ice cream buckets! I loved this one! Have you read In the Mountains? It was quite fascinating as well — different in ways but as sharp as any other Von Arnim! Haven’t read In the Mountains. I have a long list of “want to finds” in the Von Arnim canon. Looking forward to reading more of this author.